ACRE OF PEACEFUL LIVING CLOSE TO ORLANDO! 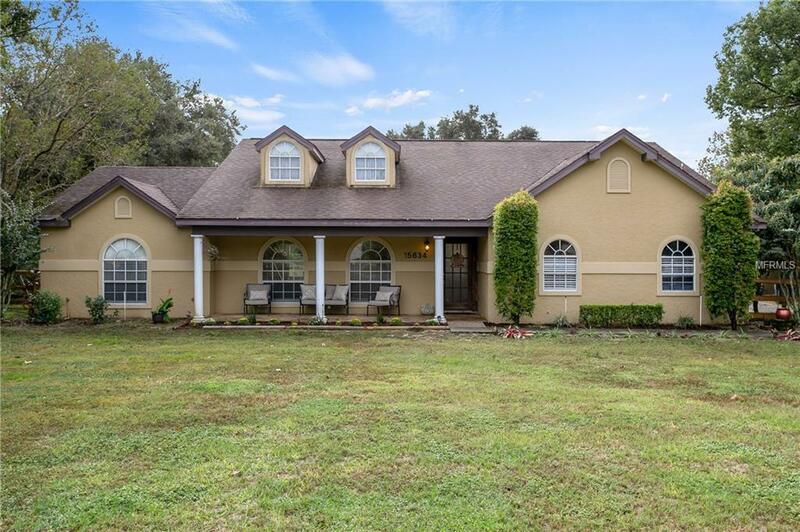 A true farmhouse style gem in the heart of Central Florida! This immaculately maintained four bedroom and two and a half bathroom home, with a garage and workshop space, is located on an oversized lot and has been kept in move-in ready condition. The home's semi open floor plan leads you into a family room with vaulted ceilings, large window, skylights and laminate floors. Off the family room is a dining nook and chef's kitchen complete with updated appliances, solid wood cabinets, updated counter tops and the home's original entertainment charm. This centralized space of the home is spacious and perfect for entertaining and enjoying the Holiday season! The home's four large bedrooms include excess closet space, ceiling fans and natural light. The large master suite features a master bathroom on suite complete with dual sinks and a large frameless shower. Enjoy the warm Florida summers in the HUGE, FULLY FENCED backyard space complete with outdoor lighting and chickens! The home's recent upgrades include a recently replaced dishwasher, recently replaced hot water heater, updated kitchen, termite bond, water softener and filter system, and LED lighting throughout the entire home. This home is located close to shopping areas, established restaurants and easy travel routes to other Orlando areas. Schedule your showing before it's too late!